Take your beverage of choice along for the ride with this sweet heavy duty acrylic retro travel mug featuring a vintage Fifties era tin toy robot. A little outer space kitsch on your coffee cup is a great way to start the day! This travel mug will hold up to 12 ounces of your hot or cold liquid of choice and is hand washable but please do not place in the dishwasher. The images are printed onto photo paper which I then completely seal with a hot lamination system to they will be waterproof for many a year to come. 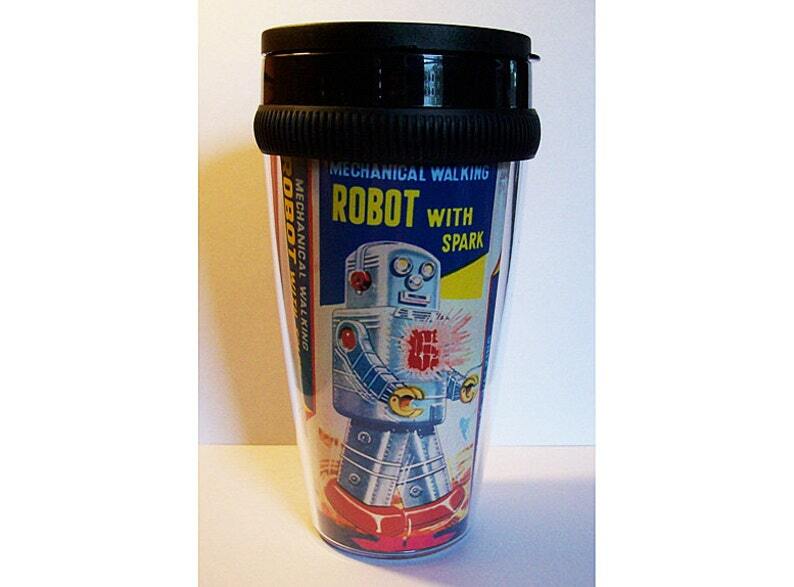 I can also make this style of mug with robots on both sides or with the outer space pin ups on either side. If you would prefer one of these options just write me a note during checkout.